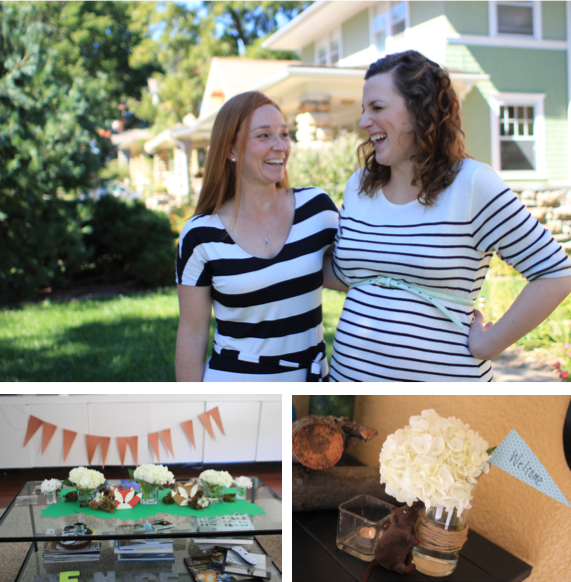 the weekend before last, i hosted two special baby showers for two very special gals. and while baby showers tend to be about the babies, i wanted each to be as distinctly different as the moms-to-be, because really, that is who we were celebrating. if you missed natalie's shower, you can see it here. but today, we're all about kate and the whimsical little forest friends who helped create her woodland themed shower. kate is awesome. we met through a mutual friend and it took me two minutes and two sips of a martini to know that this was gonna be good. she is ever so whimsical and suuuuper nice. and i have to be honest, finding really genuine people is sort of a rarity these days. you could try to find something about her that you didn't like, but it would be pointless. i don't think that something exists. actually i know it doesn't. so naturally, when kate and tim told us they were expecting, i jumped at the chance to shower her with love and whimsy. and when i asked her if she had a preferred theme and she sent me paint chips, my little heart jumped for joy. this is a girl who knows what she wants and knows i love a good mood board/color pallet for inspiration. what kind of person hosts two baby showers in one weekend is the question you might be asking yourself, but i assure you, there is method to the madness. all of our friends are pregnant right now. pretty much all of them. plus, weekends in the fall, fill up fast. so what's a girl to do when you have two lovely people to celebrate and limited time - you select one weekend and just go for it! i wondered somewhere in the process if it was insane, but once they were both underway, i also realized it was a pretty great way to see a whole lot of friends in a very limited amount of time. in addition, i can't be expected to clean my house twice in a single month, so really this was about efficiency. if you know of anyone who is having a girl right now, just tell them to give me a call in 25 years. with just about everyone we know having boys, there is bound to be a surplus of suitable suitors roaming around. at any rate, i am super excited for my friends and the new adventures they are about to take on! congrats to kate & tim - we can't wait to meet little simon soon!